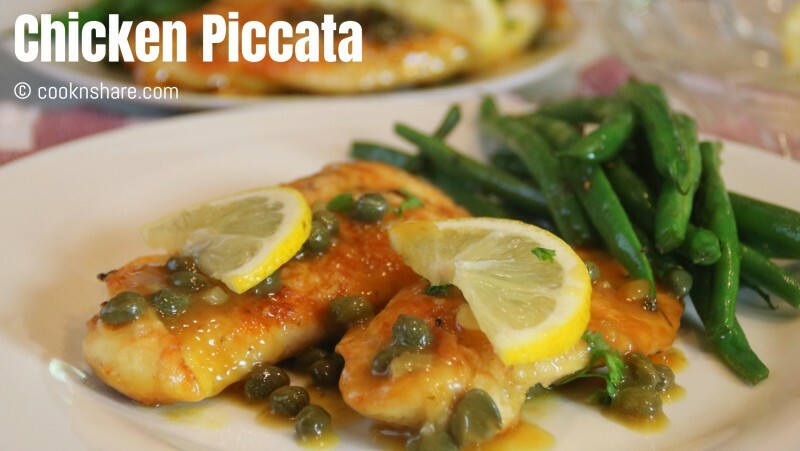 Chicken piccata is a quick and easy dish. It involves a simple combination of boneless skinless chicken breasts sliced in half and pounded flat. After that they are dredged in flour and fried. This is followed by a super yummy sauce consisting of butter, garlic, white wine, chicken stock, lemon juice, more butter, and capers. Simply put the chicken back in and serve. Lay each breasts on wrap on top and bottom and pound them out until about ¼ in thick. Season them with a good application of salt and pepper. Dredge the chicken in the flour and set them aside on a plate. Add olive oil to a preheated pan and fry the chicken for about 3 - 4 minutes on each side.Set them aside on a plate. In the same pan, add in 1 knob of butter and allow it to melt down. Add in the garlic and saute for about 30 seconds to 1 minute. Pour in the white wine, chicken stock, lemon juice, stir and bring to a boil. Add in the other knob of butter followed by the capers and stir until combined. Put the chicken back in and spoon the sauce over. Simmer for a couple of minutes. Turn off heat. Garnish with chopped parsley and place the lemon wedges over the top. Enjoy your one pan chicken piccata.